I love doing newspaper research. Have you tried it? I was on Newspapers.com the other day doing a surname search for one of the alternate spellings of my last name Heiser. It is also spelled Hiser, Hyser, and a few other ways. Using Hiser, I searched in Maryland newspapers from 1870-1880. I narrowed down to newspapers serving Frederick and Carroll Counties. I wasn’t expecting anything beyond the basics, so I was surprised to find this 1873 article about my great grandfather, Joseph Henry HEISER, Sr. (1861-1945). Toby, as he was called, was 12 years old at the time of this accident. How frightened his parents must have been. There was never a follow up article about Toby healing, but we know he did. So how were serious burns handled in 1873? Prior to the 1800’s, poultices and oils were the only treatments for serious burns. The survival rate was low. At the time when Toby was burned, colloidal silver was commonly used. It was applied to the burned areas, and it worked to prevent infection. Antibiotics wouldn’t be available for some decades yet. Skin grafts had begun in 1869, but I don’t know if Toby had any skin grafts. Maggots were used to debride the burns in the 1800’s. He may have had that treatment. Toby survived his burns and went on to work as a laborer and as a sawyer in a saw mill. He married and had several children. According to the 1930 census, 69-year old Toby was still working, not as a sawyer or a laborer, though. He was an elevator man at a chain plant. The burns to Toby’s chest and arms didn’t appear to have a lifelong effect. Toby was actually fortunate and blessed to survive the burns at all. He went on after that to live a full life, passing at 83 from a stroke. I still wonder, though, why he had gunpowder in his vest pocket. What interesting family stories have you found in newspapers? Comment below. One does wonder why he had gunpowder in his pocket! The accident could have been so much worse. Thank goodness it was only as bad as it was. It was interesting to read how burns were treated during that time. I didn’t realize that skin grafts began so early. Newspaper articles have given me a wealth of information about my ancestors and collateral relatives. Since family didn’t tell stories, it was my second search source after census records. I was surprised, too, about skin grafts starting so early. I usually use Newspapers.com and Chronicling America. I didn’t find Genealogy Bank to be useful for my ancestors. What newspaper websites do you use, Nancy? Wow! 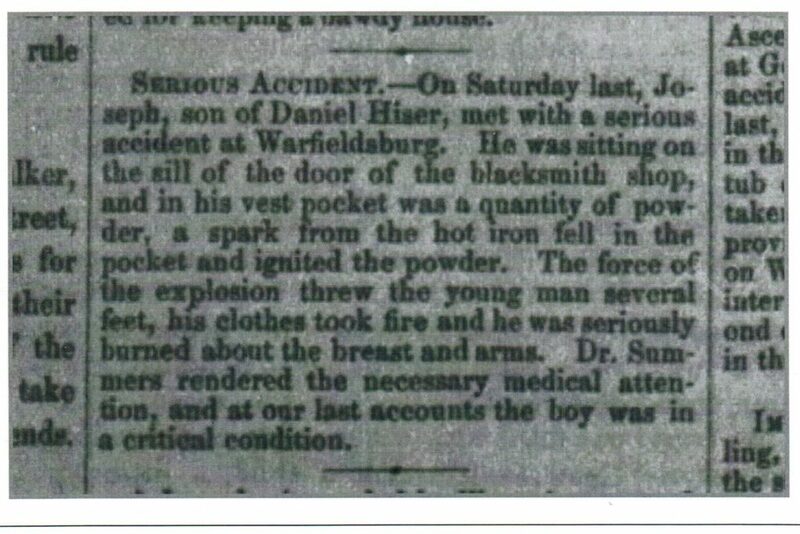 What a terrible accident, but a fascinating bit of family history tucked away in the newspaper. It really underscores the value of newspapers for genealogy research. You never know what you’ll find.